Haven has always been a port of call for travellers going to and from the Great Gnarl and Dragonport. The city itself lies on a convenient hub of roads that link many important locations throughout Blackmarsh. What once was just a stop off point of shanty towns for the great caravans that travel around Blackmarsh became a governed township with its own laws, regulations and culture. The government that formed a loose association of merchants to begin with eventually developed into the Guild of Golded Gambits. As the wealth and prosperity of Haven increased, so did it's size and influnce. 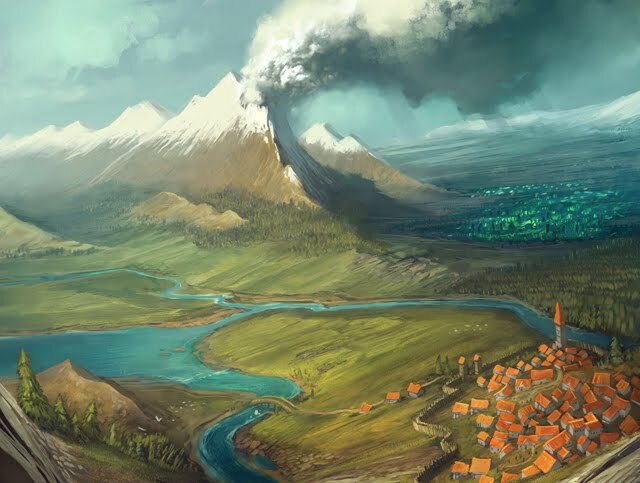 Nowadays Haven city proper is merely the central point of institutional power for a wide array of provinces and others towns and villages stretching in all directions. Nearly all buildings within the walls of Haven are stone work in their construction. Haven itself is dominated by its large open city sized plaza right at the heart of the town. Here vendors and other institutions of commerce conduct their business. Here resides the Guild of Golded Gambits, the governing merchant body of Haven. Also to be found is The Smoking Gnu, a famous tavern known far and wide for its seedy atmosphere and bar wenches of negotiable affection. Haven is an ever growing city due to the high number of trade routes that convene on its position geographically. This has been an ongoing problem for the government of Haven as the cities isolated position makes it vulnerable to attack. For adequate defence a well manned and heavily fortified stone wall is maintained around Haven, protecting its citizens. Unfortunately this limits the rate at which the town can expand and as a result many shanty towns have sprung up around the the city wall. Known by locals as The Shifts, this ever changing maze of tents and stalls is home to merchants, traders and thieves alike. Haven is central hub of commerce. Over forty different major roads and several much traversed rivers all convene on its location. Commerce and equipment of all kinds is available 24/7 within and without its large stone walls, making it an ideal place for adventurers seeking equipment. Perhaps Havens biggest trade good of value is information. So many travelers come and go through this metropolis that news from all across the Blackmarsh can be found here, often regardless of it's accuracy to the truth. Such is the strength of this tapestry of gossip in Haven that it has become part of a well known phrase for describing something as being highly unlikely, the mantra of skeptics far and wide has become, "Well, you heard it in Haven first!" Haven is known for Lightning Rail Hub 2, the biggest lightning rail hub on the continent. Havens is vastly overcrowded. It inhabitants, both permanent and temporary literally spill out of its city walls and into the surrounding area. 1 Haven Plots: The Ruins of Kraniskron 4/24/2012 The Crown of Korbore was recovered by a group of adventurers. 2 Haven Plots: Haven Patrol 5-22-2012 Adventurers were hired to find a lost patrol belonging to the Guild. 3 Haven Plots: Haven Patrol 2 5/31/2012 The group of adventurers was hired by the Guild to trace the beast reponsible for killing many villagers in the outlying regions of the town. 4 Haven Plots: Haven Patrol 3 06/01/2012 The guild hired adventurers to find the location of a formian hive entrance deep in a desert north of the city. 5 A Cleric Apart 6-08-2012 Tom went there to find the Octagon, but found a plan by the College of Necromancy instead. 6 Haven Plots: The Attack on Glibbontrop 06/28/2012 The group came across Glibbontrop, a village in the provincial region around the city state Haven. It had been attacked and nearly destroyed by Redcaps. 7 Haven Plots: The Beast of Badwater Blows 06/29/2012 The adventurers were hired to clear out a graveyard and a crypt of a terrible beast. 8 Haven Plots: Glibbontrops' Unlucky Streak 07-15-2012 The group was hired by the Guild and led to Glibbontrop where they were informed of the deaths of locals, and the danger that lurked in going near the village. 9 Haven Plots: Greenskins for Gold Coins 2 07-19-2012 A group of adventurers was recruited to alleviate the problem of the orc menace around Haven. 10 Haven Plots: Greenskins for Gold Coins 3 07-21-2012 A group of adventurers was recruited to alleviate the problem of the orc menace around Haven. 12 Haven Plots: A Fisherman's Woe 07-26-2012 Another party found well paid work here. 13 Haven Plots: Brunch in Badwater Blows 08-09-2012 An old undead problem resurfaced in Badwater Blows. 14 Haven Plots: Haven Under Attack! 08-21-2012 The orc menace rises like never before! 16 Haven Plots: Elria is Missing Part 1 08-25-2012 A nobles daughter has gone missing. 18 Haven Plots: Elria is Missing Part 2 08-30-2012 Dire wolves roam the wilds around Haven. 19 Haven Plots: Elria is Missing Part 3 09-12-2012 The Manbane caves live up to there name. 20 Haven Plots: Elria is Missing Part 4 19-09-2012 Elria is finally recovered!